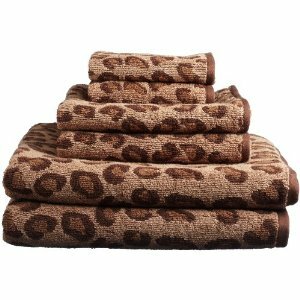 Liven up your bathroom with the Divatex Animal Print Towel Set. With fierce, bold prints these pieces stand out in any decor. Embrace the incredibly chic and stylish look of this set and enjoy its soft, absorbent feel. Leopard towel is a 100-percent cotton, and it comes in other different animal skins. Jacquard 6-piece towels set includes two 27 by 54 bath towels, two 18 by 28 hand towels and two 13 by 13 wash cloths. The set comes in a positive/negative reversible gold/black color combination.